Located just three and one-half blocks from shopping and restaurants, this cozy log cabin offers a comfy, quiet and enjoyable stay. The log cabin dates back to 1870 and was moved to this spot from Missouri and embellishes the phrase of “story book charm”. The bedroom was added on and built from native rock creating a true Texas pioneer home. Enjoy the front porch to unwind and relax. Downstairs is the kitchen, bathroom and bedroom. A queen bed in the bedroom topped with a floral comforter and fluffy pillows offers both comfort and luxury. The bedroom has an armoire and television. The kitchen has a two-burner stove, microwave and refrigerator. An antique table for four is perfect for your morning coffee. The bath has a unique shower—it is lined with tin carrying over that log cabin rustic feeling. Texas pine antiques are found throughout the house to emphasize the storybook charm the log cabin already offers. Upstairs is an entertainment loft used as a “game room” with sofa, television, game table and, of course, games. I stayed for a week of cycling in the Texas hill country. It was really great to have my dog along; we both felt very welcome at the cabin. Yes, it is a cabin, but has most everything you need. I am not sure if it was the bed, the setting; but I slept better than at home! The neighborhood was relatively quiet while being close enough to downtown to walk to every night with the dog. Everything was awesome, I really loved the rustic cabin and the location. My wife Tammie appreciated all the little. details. We'll be back! My husband and I, along with our two golden pups, enjoyed 3 days in the log cabin. We were celebrating our 10th anniversary. We appreciate the goodies left for us, the apples, the wine, the orange juice, milk, etc. We enjoyed the kitchen and had all our meals there in the cabin, walking the short distance into town during the morning and afternoons. Enjoyed walking our pups around the neighborhood. Also enjoyed going back to town at night to see the Christmas lights at the Market Platz. The log cabin is charming and cozy...we loved every minute. I got teary eyed when it was time to leave. Thank you so much! 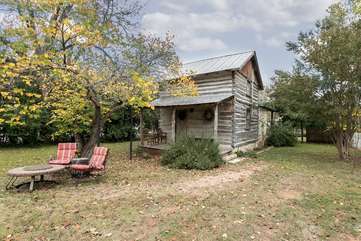 This house has all you need when staying in Fredericksburg. We were greeted with treats and drinks in the kitchen when we arrived, which was a great welcoming gift. There is a bed and kitchen, and animals are allowed, which is all we needed. There is no wifi, but who cares when you will be out and about all day.